Like our other picnic items, this foldable stool with integrated cooler has a metal badge which is perfect for engraving your corporate logo to create a striking promotional gift. Also printable, the 600D Polyester material is robust and long lasting, ensuring your gift will still be in use in years to come. 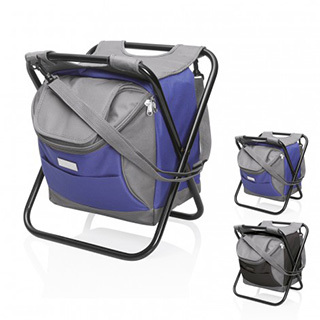 Clever velcro access hatch in the zipped lid makes for ease of access and reduces chill loss, and with strong steel tubed frame, this is a practical gift for the picnic or outdoor lover.